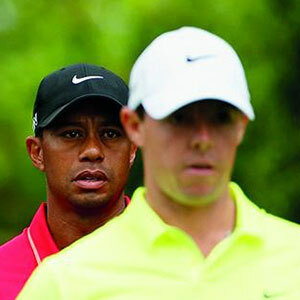 Rory and Tiger or Tiger and Rory? Whichever way round you prefer it, the 1st tee at Augusta National was simply swamped with patrons when the 1430 pairing arrived. Tiger may have been ranked outside the world's top 100 and it was Jordan Spieth rather than Rory dominating the week but this was the duo that everyone wanted to see. The greeting between them was warm and genuine, the adrenaline palpable. Rory used it to unleash his opening drive around 350 yards up the left side of the fairway. Tiger gave us a sign of things to come by hooking a 3 wood on to the parallel 9th fairway. The younger man had almost half as far in for his second shot. It would be the 13th before Tiger found a fairway, and that with a contrived fade on a hole that doglegs 90˚ from right to left – not ideal. The crowd were sure that birdies, if not eagles, would materialise at the par-5 2nd. They both missed the boat. Meanwhile, it was happening around around them, as though they were at the epicentre of the storm. In fact, it was the 7th before either could manage a sub-par figure. At least Rory wasn't leaking any oil, and in fact he was compiling his tidiest round of a week that never quite went to plan. To his credit, he remained patient and gradually climbed towards the lead, remembering that while eagles are all very well it is more important around Augusta not to give the course too much, or indeed anything, back. His round, while relatively unspectacular, was pretty much a textbook demonstration of how to manage your game at Augusta. After a slow start, it got gradually better and better and while he was never truly in contention, by the time he used the contours on the 16th to their inevitable effect, he had a short putt to go six under for the day. And this without holing a single putt of note until the final green. That closing birdie gave him a best-of-the-day 66 along with Hideki Matsuyama but his expression as he watched Tiger finish his round reminded us that this is a man only interested in first place. "McIlroy's round, while relatively unspectacular, was pretty much a textbook demonstration of how to manage your game at Augusta." As for Tiger, sad to say, the 39-year-old was playing his worst golf of the week. At least until an eagle at the 13th that was as reminiscent of him in his prime as it was unexpected on the day. By then he was back in the pack and rather then propelling him into contention, it was merely enough to get him back to level par on the day. He suffered a painful wrist injury when striking a tree root on his followthrough on the 9th but it would have been a brave man to inform him that wouldn't have happened had he been playing from the fairway. It is impossible not to get giddy about the prospect of derring-do and final-day charges when talking about players of this calibre but the reality is that no player managed better than 66 all weekend. We wondered if there was a 64 out there and there was – but Spieth had used it up by as early in the week as Thursday afternoon. Long before Spieth had slipped on his Green Jacket, the two of them were reduced to the roles of bit-part players. It didn't sit well with either. Still, there is fresh evidence to believe we will see them playing together in the Majors again soon. We must remember that Tiger exceeded all expectations to go into the final day with even a chance of a fifth Masters title. As for Rory, if he can play – and especially putt – so averagely and yet still finish inside the top five at Augusta then it is surely only a matter of time before he completes his career Grand Slam. He will take much from this week, even though he won't care to until the disappointment subsides – such are the standards he sets. The bad news for him is that a genuine rival has emerged in the quest to amass Major championships. In the not-too-distant future, it may be that Spieth/McIlroy is the most box-office pairing that the game can provide on the final days of Majors and Ryder Cups. Bring it on.